Every day, construction professionals are tasked with anticipating constraints, balancing speed with budgets, overseeing day-to-day work and preparing for activities months ahead of their scheduled dates. In the midst of those make-or-break tasks, it’s easier to stay focused on the big things when the simple things are already handled. In support of this philosophy, several Robins & Morton jobsites shared easy fixes to sometimes painful inconveniences. Check out these five simple solutions to turn common frustrations into peace of mind. Upgrade your temporary exit signs. 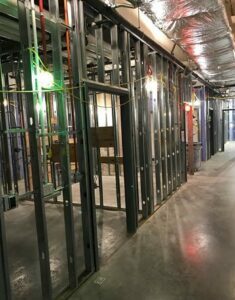 In the beginning stages of construction, it can be difficult to locate temporary exit signs and fire extinguishers in a large space with nothing but metal studs. Realizing this, team members from our Shawn Jenkins Children’s Hospital and Pearl Tourville Women’s Pavilion project in Charleston, South Carolina, decided to replace those paper wayfinding signs with temporary light strings. From across the floor, trades and visitors on the job can see green lights signaling all exits and red lights signaling all fire extinguishers. Protect your utility stub-ups. 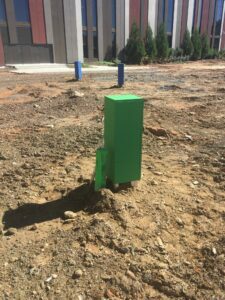 In the early stages of construction when heavy equipment roams the site, it can be difficult to spot utility stub-ups. As a result, they are often hit and damaged, requiring re-work, more money and more time. 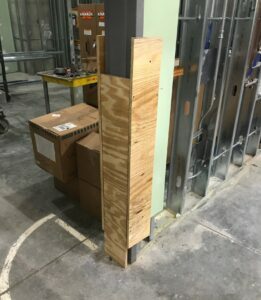 Our Harrah’s Cherokee Valley River Multi-tainment Center addition team had the idea to build wooden boxes around the stub-ups to protect them from damage and provide larger, more noticeable obstacles to maneuver around. As a bonus, each was color-coded: blue marking storm/water lines, green marking sanitary lines and red marking power lines. Build an organization station. 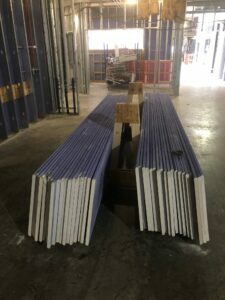 With many trade contractors keeping the bulk of their equipment and building needs in one area of the jobsite, the drywall contractor at our Choctaw Health Poteau Wellness Center project decided they didn’t want to waste time running back and forth to their central supply. Instead, they built portable wooden bins with partitions for each size of screw they need for their tasks within given areas. Some of their larger bins even had wheels so they could be towed instead of toted. The Shawn Jenkins Children’s Hospital and Pearl Tourville Women’s Pavilion project team also helped create a similar item for their framing contractor. 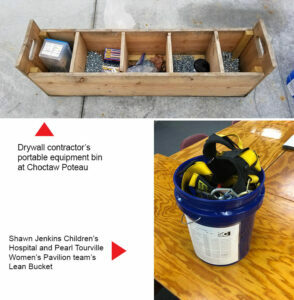 Their “Lean Bucket” had four compartments for shots, pins and two types of screws and can be stocked with enough supplies for the entire day. Additionally, quality management checklists are attached to the outside of the buckets for quick review. Protect your door frames. Once final door frames are installed, it can be a challenge to keep them from getting scratched, dented and damaged by moving building materials or equipment if work is still in progress in the space. To avoid the possibility, our Beverly Knight Olson Children’s Hospital, Navicent Health, project team started covering their door frames and all points of potential impact with plywood while using certain rooms as laydown space. Utilize drywall stands. Tired of the risks associated with transporting drywall? From accidental damage, to the possibility of injuring yourself if moving it improperly, drywall can cause a host of unnecessary headache while in transit. Instead, stack drywall on board stands and eliminate both material waste and potential safety concerns from the equation. They are cost effective at approximately $15 to make, and sustainable, as they can be reused throughout the project.